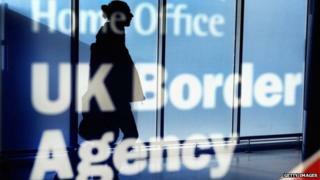 The government "increased anti-immigrant prejudice" by not getting an estimate of the number of Romanians and Bulgarians coming to the UK ahead of restrictions ending, MPs have said. Both nationalities gained full rights to work in the UK on 1 January. The Commons Home Affairs Committee said a lack of data would allow tensions to be inflamed, although numbers coming seemed a "trickle rather than a flood". The Home Office said it "totally" rejected the MPs' claims. Transitional arrangements limiting the work that Bulgarians and Romanians can do in the UK, in place since they joined the EU in 2007, expired at the start of the year. But, in its report, the committee said the government had been "wrong" not to ask the Migration Advisory Committee to compile advance estimates of the number of people likely to come. It recommended an audit of the number who entered the UK during the transitional period from 1 January 2007 to 31 December 2013 and "their social and economic impact upon the UK, and the balance between their contribution and their usage of the social security system". The committee also called for a count of those who had come since 1 January and "an assessment of how many are likely to come in the near future". It said: "We are concerned that the decision not to commission has increased anti-immigrant prejudice and has been commandeered by those who wish to inflame tensions about immigration for political gain." But it added: "The committee has seen no evidence to suggest that there has been an increase in migration from Romania and Bulgaria. It would appear rather more a trickle than a flood." Its chairman, Labour MP Keith Vaz, said: "The government's failure to commission an estimate of these numbers has led to unnecessary anti-immigrant prejudice and is a blot on our tolerant society. "It is essential that for future enlargement of the EU the government commission research on the impact of migration to the UK. If they do not do so, the committee will." Their report said evidence of "benefits tourism" was limited. For Labour, shadow immigration minister David Hanson said: "This report shows that the government woefully failed in its primary duty to prepare for the ending of transitional controls on Romania and Bulgaria." A Home Office spokesman said: "We totally reject the committee's suggestion that not attempting to forecast the number of Romanian and Bulgarians who might come to the UK after the expiry of transitional controls has led to 'anti-immigrant prejudice'. "Any such forecasts would have lacked all credibility - indeed, the failure of previous attempts to predict likely numbers of EU migrants in the past only contributed to the public's concern about uncontrolled immigration." The spokesman added: "The Migration Advisory Committee said it would not have been sensible or helpful to make guesses ahead of 1 January. "Our reforms to restrict access to the NHS and other benefits mean British citizens can have more confidence that those who come to the UK do so for the right reasons - to work hard and contribute to society."